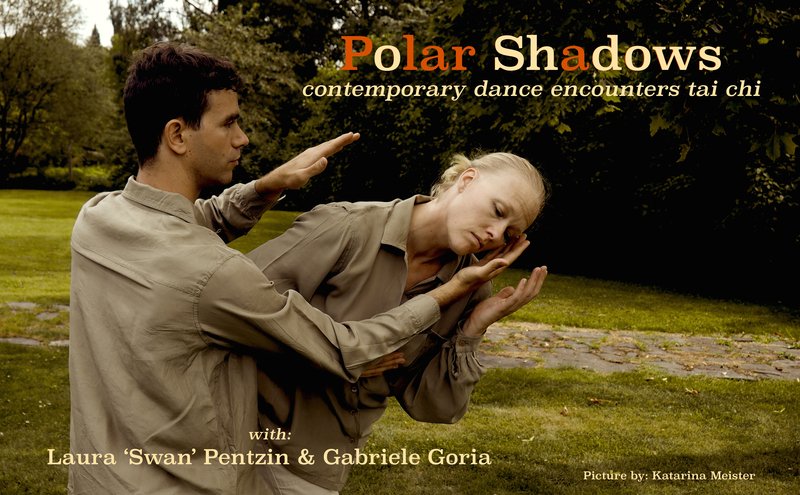 Polar Shadows is a live installation, where tai chi becomes the framework for an improvisation of contemporary dance. The dancer and chreographer Laura ‘Swan’ Pentzin has performed with Gabriele Goria – kung fu teacher and actor – in various productions since 2015. Their work is still in progress, aiming to go on stage in autumn/winter 2018. Throughout the live installation, Gabriele Goria performs the 108 steps of the Yang-style tai chi, in the unique tradition of Master Chang Dsu Yao. Tai chi – the ‘Supreme Polarity’ – is the archetype of a fundamental law of nature: the dynamic principle of change. By means of slow and circular movements, tai chi incarnates this waving flow, where Yin and Yang take birth from each other. How can contemporary dance respond to this ancient embodied philosophy? Laura Pentzin engages in a profound artistic exploration of tai chi, through her multi-layered expertise in various approaches to dance. By tuning with the flow, or deliberately contrasting it, Laura dances together with energy and space, at times spontaneously depicting the images emerging from the poetic Chinese names of the tai chi sequence. Thank you, Katja: I’ll invite you when the performance is ready!